It’s been almost a month since I last posted anything! One of my kids picked up a bug and then generously shared it with the rest of the family. So for the past few weeks I’ve either been unwell or been looking after unwell kids. Even as I write this, I can hear the chesty cough of one of my boys coming from upstairs. 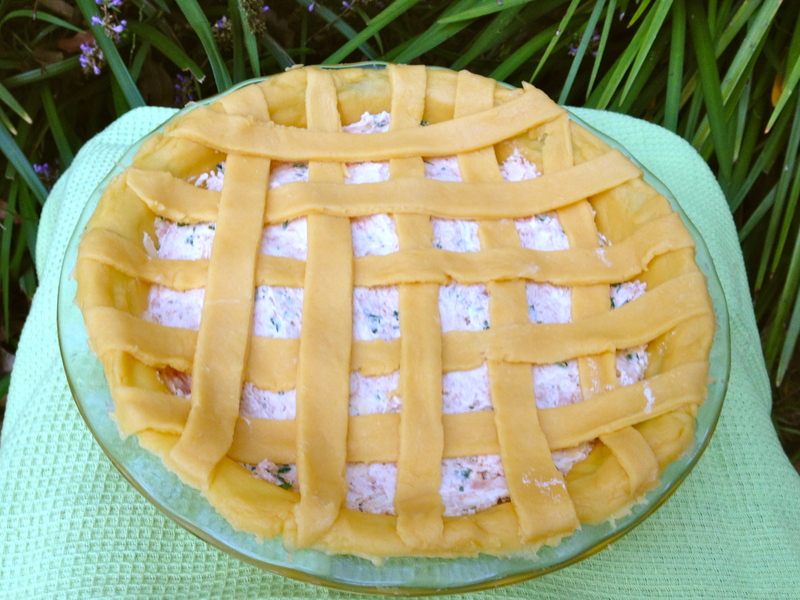 This week’s Tuesdays with Dorie recipe, Pizza Rustica, almost didn’t happen. It was easy enough to motivate myself to take part in this week’s recipe. I really enjoy being a part of the group! I picked the day to bake. I organised myself and planned things so the day would be relaxed and leisurely. I had three loads of washing done and hanging before 8.30am. I was feeling good and on track! As we walked out to the car to leave for school, we could hear a loud engine starting next door. We sat in the car and watched workmen with generator powered hoses strip the paint off the house next door and land all over my three loads of washing. It’s okay, I kept telling myself. Then, my 4 year old, who seemed like he was finally getting better, began vomiting. When we arrived at the doctor, he told me we had to go back home “NOW” so he could go to the toilet. We made it back home just in time! Then back in the car and back to the doctor! Finally, after a stop at the chemist for medication, we were back home and I was ready to cook! I made the dough, it was incredibly easy. I opened the ricotta to prepare the filling and quickly realised I picked up a tub with an expired date. I raced back to the store and picked up the last two tubs of ricotta, yay! They had just the right amount of ricotta I needed! Raced back home to find the seal on the second tub was broken! After a minute or two of contemplating giving up, I decided to just add the block of Philadelphia cream cheese I had in the fridge. As the kids say, booyah! I was feeling pretty pleased with myself! All the running around meant my pizza rustica was ready much later than planned. Which was no big deal. Until I realised it was the first day of daylight savings in Sydney and by the time it came out of the oven it was pitch black outside and I had no chance of taking a decent photo of the finished product! I wasn’t happy with my photos and I honestly contemplated not posting at all! But I really enjoyed the taste of the pizza rustica and felt it would be crazy to have gone through all that and not post! The dough was so deliciously sweet. I loved it. The filling was incredibly salty and cheesy. .
Whoever thought of putting the two together was a genius! What a wonderful balance of sweet and salty! I am so glad I persevered! If you want to try it for yourself, Emily of Capitol Region Dining and Raelynn of The Place They Call Home, are this week’s hosts and will have the full recipe on their blogs. If you would like to check out what other members of Tuesdays with Dorie thought of this week’s recipe, head on over! Tags: baking, cooking, food, pizza, recipes, ricotta, Tuesdays with Dorie | Permalink. Whew – I definitely know those days. My whole month of February was filled with sick people (namely me). Looks like you came through your trials with flying colors. Booyah, indeed. Nice job on persevering! I too loved the sweet-salty balance. I will have to try it with some cream cheese. I’m glad you decided to post. Your dish looks tasty. Hope everyone is feeling better! I am so glad you did post and it looks wonderful no matter what! So sorry you had one thing after the other trying to keep you down! I know what it is like to be icky sick, I am just now getting over being sick for 3 weeks! Oh No! I hope things calm down and everyone is healthy soon. Another day in paradise! Glad you liked your pizza in the end. Hope your household gets well soon! Wow you did do well getting it baked. The pictures are fine and most importantly it tasted good!! Taste is much more important than photos 🙂 And I’m so happy you loved this one, too! Welcome back! What a day! I’m glad it had a happy ending with your beautiful Pizza Rustica. Glad to find another familiar “face” participating in TWD.